So here we are, ready to announce the RPG World Cup 2018! We’ve selected thirty-two games/series to compete head-to-head in a Twitter Poll Extravaganza. Beginning June 11, we will roll out Twitter polls with RPGs from all over the genre, and your responsibility will be to select which game or series should advance to the next round. This won’t be easy as you’re going to have to choose favorites between your darlings, but you can do it – we believe in you. 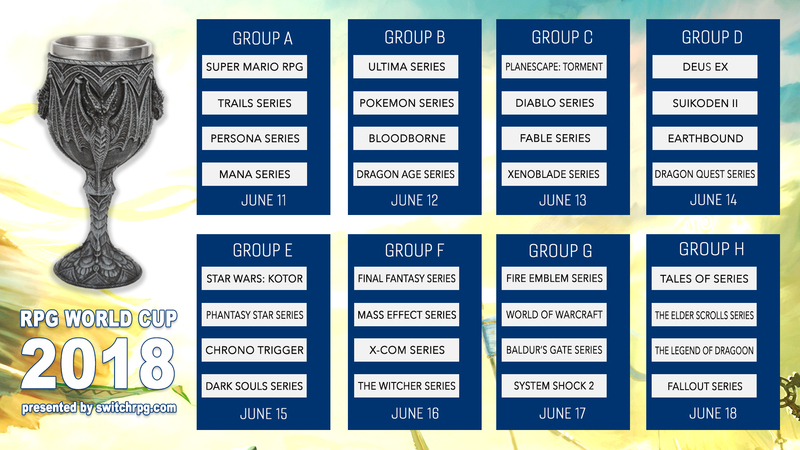 Above is the list of all the games and series competing in this year’s tournament. The first round of voting will be done as a group stage, each poll consisting of four options (check the groups to see who will be facing one another). You can also see what day a group will go live. Voting will last twenty-four hours for each group, so make sure you check back everyday to make your choice count! If you have a favorite in this race, be sure to share the polls with your friends, and do everything you can to keep your choices alive. After each poll closes, the two entries from each group with the most votes will advance to the next round. Once the group stage ends, the remaining games will go one-on-one in a knockout-style tournament/playoff until only one remains. That one game will be crowned as our champion. Please understand, we’re not trying to decide on a definitive “best” RPG or anything like that. This is in no way trying to compile a “greatest of all time” list. This is just for fun, for hype, and for silly heartbreak (the moment Dragon Age gets eliminated, I’m going to have to take a day off from work). This event cannot work without participation, so we ask that you take 12 seconds to vote and to share with everyone you know who gives a rip about RPGs. Remember, June 11, it all goes down over at www.twitter.com/switchrpg. Crown your champion. Make your vote count. Need help getting hyped? Check out the video below. I’ll see you on the battlefield.